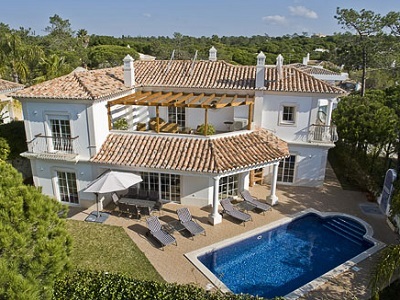 Check out the super Algarve tennis holiday accommodation options that we have for you at Algarve Tennis & Fitness. For full details of any of these properties, contact us today quoting the property reference numbers of interest and we'll send you all the information you need, including availability by return. Book your Algarve tennis holidays with Algarve Tennis and Fitness this year and enjoy the very best tennis and sports facilities that the Algarve, Portugal has to offer! 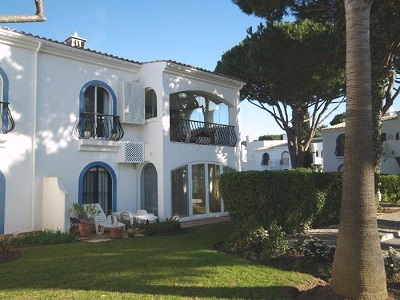 Comfortable air conditioned ground floor apartment located in communal gardens within the popular family resort of Dunas Douradas. Close to all central facilities including tennis courts, communal pool, childrens pool, mini market, central reception facility. Please note, the pool area is enclosed and may only be accessed with a key fob. Temporary key fobs can be obtained from the main reception subject to a €20 refundable deposit. Three bedroomed village house with fenced garden located in the well-known resort of Dunas Douradas. Fully equipped kitchen including microwave, serving hatch to dining area. Nicely decorated lounge and dining area. Lounge with comfortable sofas, wood burning stove, cable T.V. and dvd player, adjacent dining area with doors to terrace. From terrace stairs lead down to garden area. Lovely, well decorated 3 bedroom, 3 bathroom, semi-detached town house with plunge pool, located in an elevated position. Wood burning stove, plasma TV with Satellite,and DVD player. Adjacent dining area also with access to the outside area and portable BBQ and with serving hatch to the kitchen. Wi Fi Internet access available. Air conditioned throughout. Modern 4 bedroom villa with swimming pool, tastefully furnished throughout, located in the resort of Vale do Garrão close to Dunas Douradas, near to championship golf courses, the famous golden sandy beachs, bars, restaurants and shops. Comfortable sofas, TV, DVD and CD system. Dining area with table to seat 8 and very well equipped kitchen with large ceramic hob, microwave, dishwasher, 2 fridge/freezers and wine cooling cabinet. Basement also has games rooms with comfortable sofas, pool table, table top football and table tennis. .
New, modern detached 4 bedroom villa furnished to a high standard throughout. Distant sea views. 3 minute´s walk to the golden sandy beach. Gated access to main entrance with spacious entrance hall giving acces to bright and spacious open-plan lounge, dining and kitchen. Comfortable sofas, TV, DVD and CD system. Portable gas BBQ and outside fireplace area, rectangular pool with integrated steps, solar pool cover and pool heating (supplement payable £160 per week), Use of Dunas Douradas resort facilities. Modern 5 bedroom detached villa with cinema & games room located in a gated resort within Vale Formoso, Almancil. Just a short drive to the golden sandy beaches, championship golf courses, shops, banks, bars & restaurants. Bright, spacious lounge/dining area furnished with comfortable sofas, flat screen TV and glass top dining table. Covered upper terrace with outside sitting area, dining table and portable gas BBQ. Large rectangular pool and pool terrace, grassed area and ample space for sun bathing. We are able to organise low cost accommodation for you, your party or tennis club in the best local hotels throughout the year. 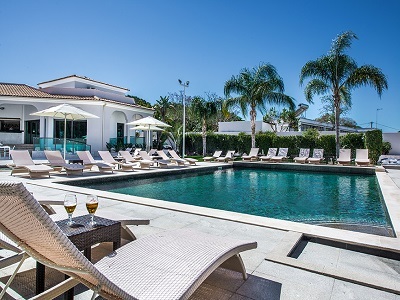 All have access to swimming pools, shopping and local beaches and are within a very short distatnce of our Algarve Tennis and Fitness centre.